Chronic periodontitis is an infectious disease associated with specific bacteria and characterized by inflammation of supporting tissues of teeth and progressive destruction of alveolar bone and connective tissue. The progression of destructive disease seems to be dependent on an abnormal host response to sub-gingival plaque biofilm. Over the past few years, strong evidence has emerged to implicate oxidative stress in pathogenesis of periodontitis. Free radicals and reactive oxygen species (ROS) are essential to many normal biologic processes. At low concentrations, these free radicals stimulate the growth of fibroblasts and epithelial cells in culture, but at higher concentrations it may result in tissue injury. Dental plaque harbors a number of bacterial pathogens which stimulate host cells to release various interleukins and TNF-α. These pro-inflammatory cytokines attract polymorphonucleocytes (PMNs) to the site of infection. PMNs encounter this bacterial challenge by producing proteolytic enzymes and O 2 by oxidative burst. The human body has developed an anti-oxidant defence system comprising endogenous anti-oxidants such as Vitamin A, C, E, and B, carotene, and enzymatic oxidants such as superoxide dismutase, catalase, and myeloperoxidase. This antioxidant system functions to detoxify ROS and modify them to form less reactive species. Medline and PubMed databases were searched under the following key terms: ROS, oxygen radicals, free radicals, antioxidants, and periodontitis. Only highly relevant articles from manual and electronic databases were selected for the present review. The aim of this review is to highlight the role of ROS and antioxidant defence systems in the pathobiology of periodontitis, and also to search for possible therapeutic modalities for future host-modulating therapies. It is well known that free radicals and ROS are essential for many biologic processes. They are produced as superoxide ions by neutrophils at the site of infection. Free radicals have been defined as any species capable of independent existence that contain one or more unpaired electrons. They are, by nature, highly reactive and diverse species, capable of extracting electrons and thereby oxidizing a variety of biomolecules vital to cell and tissue functions, which not only include oxygen-free radicals, but also nitrogen and chlorine species. ROS is a term that has become more popular because it encompasses other reactive species which are not true radicals but are nevertheless capable of radical formation in the intra- and extra-cellular environments. True free radicals includes superoxide hydroxyl (O 2•- ), perhydroxyl (HO 2•- ), hydroperoxyl (HOO• ), alkoxyl (RO• ), aryloxyl (ArO• ), arylperoxyl (ArOO• ), peroxyl (ROO•- ), acyloxyl (RCOO• ) and acylperoxyl (RCOOO• ), whereas ROS includes hydrogen peroxide (H 2 O2) , hypochlorous acid (HOCl), singlet oxygen ( 1 O 2 ), and ozone (O3 ). Body cells are exposed to oxidants originating from a large variety of endogenous and exogenous sources. Exogenous sources include heat, trauma, ultrasound, ultraviolet light, ozone, smoking, exhaust fumes, radiation, infection, excessive exercise, and therapeutic drugs. ,, Endogenous sources are primarily: (a) By-products of metabolic pathways, electron leakage from mitochondrial electron transport systems forming superoxide; (b) Functional generation by host defence cells (phagocytes) and cells of the connective tissues. These oxidants whether they are free radicals or ROS play an important role in periodontal tissue destruction. Anti-oxidants are "those substances which when present in lower concentration are compared to those of oxidizable substrate, will significantly delay or inhibit oxidation of that substrate." Anti-oxidants can be categorized on the basis of their mode of function, their location of action, solubility, and their origin/source. Few important classifications are described in the [Table 1]. Providing favorable environment for the effective functioning of other anti-oxidants. Anti-oxidant defence system is very dynamic and responsive to any disturbance taking place in redox balance of body. It neutralizes the free radical formation that could take place due to oxidative stress. There are currently no gold standard methods for measuring anti-oxidant capacity or ROS-mediated tissue damage in human biology. All systems utilize different indices of measurement and the specificity of the biomarker employed will dictate the measurement obtained, which differs between assays and between different biological samples and their components. Free radicals and other reactive species have extremely short half-lives in vivo 10−6 -10−9 s and simply cannot be measured directly. In vitro systems, called spin traps, are used to measure radical species but there are currently no suitable spin traps/probes available for in vivo measurement of ROS production in the human. So, measurement of ROS is done by measuring the concentration of biomarkers of tissue destruction. These biomarkers are described in brief in [Table 2]. ROS are produced in animals and humans under various physiological and pathological conditions. They act in phagosomes as agents toxic to micro-organisms, fungi, parasites, and neoplasmic cells. While most ROS have extremely short life they can cause substantial damage to tissue and cellular components, e.g., cellular phospholipid, nucleic acid, protein, carbohydrate, and enzymes. The tissue destruction can be assessed by measuring the levels of markers for lipid peroxidation, protein damage, DNA damage, and anti-oxidants. Biomarkers commonly employed for lipid peroxidation are, conjugated dienes, thiobarbituric acid reactive substances (notably MDA), isoprostanes, ethane/pentane, and other volatile hydrocarbons. Thiobarbituric-acid-reactive substances have become obsolete as a measure of ROS damage  because they lack specificity for ROS activity, being formed by mechanisms other than lipid peroxidation. Ethane and pentane may be useful biomarkers of oxidative stress, particularly ethane,  but their collection and measurement are cumbersome and technically challenging. Products of hydroxyl radical attack on DNA bases (purines and pyrimidines) and carbohydrate moieties (deoxyribose) can be measured by various methods (high-pressure liquid chromatography: Gas or liquid), liquid chromatography or antibody methods. No individual reaction product should be used as the sole index of DNA damage,  but despite this, 8-hydroxydeoxyguanosine is frequently used as a biomarker for DNA damage. The carbonyl assay measures protein carbonyl (PC) groups are formed as relatively stable end-products of protein oxidation by ROS. , PC has a major advantage over lipid peroxidation product as the marker of oxidation stress. Oxidized proteins are more stable. PC forms early and circulates in blood for longer period. But carbonyls are not specific biomarkers of ROS damage because protein-bound aldehydes and glycated proteins are also measured. Indeed acrolein is a protein-bound aldehyde that has been widely used to measure oxidative damage. At best, carbonyl levels provide average measures of protein damage by ROS in human tissues and fluids. Large number of studies from literature have suggested that an imbalance in the level of free radicals, ROS, and anti-oxidant play an important role in initiation and progression of periodontal disease. The body's anti-oxidant systems are highly integrated and complex and while the study of individual systems and species greatly improves our understanding of their role in human diseases, it ignores their co-operative activities and may present a picture that does not accurately represent the in vivo situation. As a result of their cellular and extra-cellular ubiquity and rapid rates of sacrificial oxidation the free radical scavengers confer substantial protection on vital macromolecules. They also work in concert through redox cycling reactions, regenerating each other from their respective radical species. , Free radicals, ROS, and anti-oxidants status can be measured in serum, saliva, and gingival crevicular fluid (GCF). But their levels in saliva and GCF provide a more accurate status of periodontal disease activity. Total antioxidant capacity (TAOC) has therefore been developed to reduce the costly and time-consuming task of measuring individual anti-oxidant species. Moreover, it may also account for the influence of anti-oxidant substances that are as yet undiscovered or are technically difficult to assay. Periodontal disease can be caused by immune reaction between pathogenic bacteria and host. The sub-gingival dental plaque is the main etiological agent for the initiation of inflammatory changes in the periodontal tissue. Lipopolysaccharides (LPS) and DNA from these bacteria cause the activation of both activating protein-1 and nuclear factor-kβ pathways in the gingival fibroblast via CD14 and TLR-4 (toll like receptor) and production of inflammatory cytokines. The cell component of bacteria and inflammatory cytokines causes recruitment and activation of hyper responsive PMNs and thus speeds up the production of ROS. On the other hand, activation of NF-kβ and AP-1 causes activation of osteoclasts and increases the concentration of MMP (matrix metalloproteinases), which ultimately results in tissue damage. Periodontal tissue destruction leads to over-production of lipid peroxides, inflammatory mediator, and oxidised proteins. These products further activate macrophages, neutrophils, and fibroblasts to generate more ROS. In short, we can say that in the presence of periodontal pathogens, ROS and tissue destruction form a vicious circle [Figure 1]. The majority of tissue destruction in periodontitis is considered to be the result of an aberrant inflammatory/immune response to microbial plaque adjacent to the gingival margin and to involve prolonged release of neutrophil enzymes and ROS. Most published work in the periodontal literature has focused on markers of ROS reactions with lipids. Till date, only thiobarbituric acid reactive substances and MDA have been investigated in chronic periodontitis. All the published studies have suggested that patients with chronic periodontitis have higher levels of lipid peroxidation than periodontally healthy controls. The only other data available on protein oxidation are based on immunohistochemical localization of nitrotyrosine in tissues obtained from rats subjected to ligation-induced periodontitis. ,,, All four of the animal studies demonstrated an increased presence of inflammatory cells and nitrotyrosine-positive cells in tissues associated with ligated teeth compared to controls. Oxidative stress lays at the heart of the periodontal tissue damage that results from host-microbial interactions, either as a direct result of excess ROS activity/antioxidant deficiency or indirectly as a result of the activation of redox-sensitive transcription factors and the creation of a pro-inflammatory state. It is now evident that significant relations are present between oxidant status and periodontal status, and that oxidative stress may play an important role in the pathology of periodontitis and the associated tissue damage. But it is still not clear whether this event is the cause or a result of periodontitis. 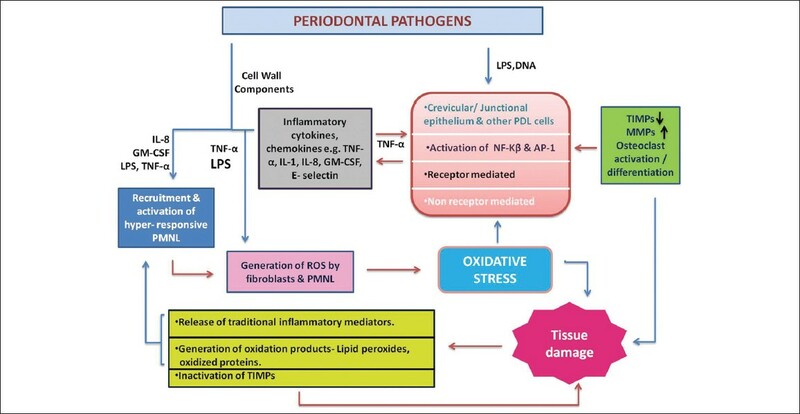 This review has discussed periodontal research work on reactive oxygen and anti-oxidant species and more recent work on redox biology. The key messages of this review article includes: (1) Smoking, infection, UV light, high temperature, etc., play an important role in generation of free radicals, so one should avoid exposure to these agents. (2) Consumption of nutrients with anti-oxidant ability like Vitamin-C and E, β-carotene, selenium, and manganese should be encouraged, as they help in fighting oxidative insults to the periodontal tissue. (3) Adjunctive use of anti-oxidants with traditional therapies should be considered to improve treatment outcome of various surgical and non-surgical periodontal therapies. 1. Halliwell B. Reactive oxygen species in living systems: Source, biochemistry and role in human disease. Am J Med 1991;91:14S-22. 2. Canakçi CF, Ciçek Y, Canakçi V. Reactive oxygen species and human inflammatory periodontal diseases. Biochemistry (Mosc) 2005;70:619-28. 3. Demple B, Harrison L. Repair of oxidative damage to DNA: Enzymology and biology. Annu Rev Biochem 1994;63:915-48. 4. Halliwell B, Gutteridge JM, Cross CE. Free radicals, antioxidants and human disease: Where are we now? J Lab Clin Med 1992;119:598-617. 5. Halliwell B. How to characterise an antioxidant: An update. Biochem Soc Symp 1995;61:73-101. 6. Halliwell B, Whiteman M. Measuring reactive species and oxidative damage in vivo and in cell culture: How should you do it and what do the results mean? Br J Pharmacol 2004;142:231-55. 7. Uchida K. 4-Hydroxy-2-nonenal: A product and mediator of oxidative stress. Prog Lipid Res 2003;42:318-43. 8. Roberts LJ II, Morrow JD. Products of the isoprostane pathway: Unique bioactive compounds and markers of lipid peroxidation. Cell Mol Life Sci 2002;59:808-20. 9. Dale O, Bergum H, Lund T, Nilsen T, Aadahl P, Stenseth R. A validated method for rapid analysis of ethane in breath and its application in kinetic studies of human volunteers. Free Radic Res 2003;37:815-21. 10. Dizdaroglu M, Jaruga P, Birincioglu M, Rodriguez H. Free radical damage to DNA: Mechanisms and measurement. Free Radic Biol Med 2002;32:1102-15. 11. Buss IH, Winetrbourn CC. Protein carbonyl measurement by ELISA. Methods Mol Biol 2002;186:123-8. 12. Levine RL. Carbonyl modified proteins in cellular regulation, aging and disease. Free Radic Biol Med 2002;32:790-6. 13. Halliwell B, Gutteridge JM. The antioxidants of human extracellular fluids. Arch Biochem Biophys 1990;280:1-8. 14. Chapple IL. Role of free radicals and antioxidants in the pathogenesis of the inflammatory periodontal diseases. Clin Mol Pathol 1996;49:M247-55. 15. Tappel AC. Will antioxidant nutrients slow ageing process? Geriatrics 1968;23:97-105. 16. Panjamurthy K, Manoharan S, Ramachandran CR. Lipid peroxidation and antioxidant status in patients with periodontitis. Cell Mol Biol Lett 2005;10:255-64. 17. Tüter G, Kurtiº B, Serdar M. Interleukin-1b and thiobarbituric acid reactive substance (TBARS) levels after phase I periodontal therapy in patients with chronic periodontitis. J Periodontol 2001;72:883-8. 18. Tsai CC, Chen HS, Chen SL, Ho YP, Ho KY, Wu YM, et al. Lipid peroxidation: A possible role in the induction and progression of chronic periodontitis. J Periodontal Res 2005;40:378-84. 19. Akalin FA, Baltacioðlu E, Alver A, Karabulut E. Lipid peroxidation levels and total oxidant status in serum, saliva and gingival crevicular fluid in patients with chronic periodontitis. J Clin Periodontol 2007;34:558-65. 20. Brock GR, Matthews JB, Butterworth CJ, Chapple IL. Local and systemic antioxidant capacity in periodontitis health. J Clin Periodontol 2004;31:515-21. 21. Wei D, Zhang XL, Wang YZ, Yang CX, Chen G. Lipid peroxidation levels, total oxidant status and superoxide dismutase in serum, saliva and gingival crevicular fluid in chronic periodontitis patients before and after periodontal therapy. Aust Dent J 2010;55:70-8. 22. D'Aiuto F, Nibali L, Parkar M, Patel K, Suvan J, Donos N. Oxidative stress, systemic inflammation, and severe periodontitis. J Dent Res 2010;89:1241-6. 23. Takane M, Sugano N, Iwasaki H, Iwano Y, Shimizu N, Ito K. New biomarker evidence of oxidative DNA damage in whole saliva from clinically healthy and periodontally diseased individuals. J Periodontol 2002;73:551-4. 24. Di Paola R, Marzocco S, Mazzon E, Dattola F, Rotondo F, Britti D, et al. Effect of aminoguanidine in ligature-induced periodontitis in rats. J Dent Res 2004;83:343-8. 25. Di Paola R, Mazzon E, Zito D, Maiere D, Britti D, Genovese T, et al. Effects of Tempol, a membrane-permeable radical scavenger, in a rodent model periodontitis. J Clin Periodontol 2005;32:1062-8. 26. Di Paola R, Mazzon E, Rotondo F, Dattola F, Britti D, De Majo M, et al. Reduced development of experimental periodontitis by treatment with M40403, a superoxide dismutase mimetic. Eur J Parmacol 2005;516:151-7. 27. Lohinai Z, Stachlewitz R, Virág L, Székely AD, Haskó G, Szabó C. Evidence for reactive nitrogen species formation in the gingivomucosal tissue. J Dent Res 2001;80:470-5. 28. Chapple IL, Brock G, Eftimiadi C, Matthews JB. Glutathione in gingival crevicular fluid and its relation to local antioxidant capacity in periodontal health and disease. Mol Pathol 2002;55:367-3. 29. Pavlica Z, Petelin M, Nemec A, Erzen D, Skaleric U. Measurement of total antioxidant capacity in gingival crevicular fluid and serum in dogs with periodontal disease. Am J Vet Res 2004;65:1584-8. 30. Diab-Ladki R, Pellat B, Chahine R. Decrease in the total antioxidant activity of saliva in patients with periodontal disease. Clin Oral Investig 2003;7:103-7. 31. Sculley DV, Langley-Evans SC. Periodontal disease is associated with lower antioxidant capacity in whole saliva and evidence of increased protein oxidation. Clin Sci (Lond) 2003;105:167-2. 32. Moore S, Calder KA, Miller NJ, Rice-Evans CA. Antioxidant activity of saliva and periodontal disease. Free Radic Res 1994;21:417-25. 33. Kim SC, Kim OS, Kim OJ, Kim YJ, Chung HJ. Antioxidant profile of whole saliva after scaling and root planing in periodontal disease. J Periodontal Implant Sci 2010;40:164-71. 34. Guarnieri C, Zucchelli G, Bernardi F, Csheda M, Valentini AF, Calandriello M. Enhanced superoxide production with no change of the antioxidant activity in gingival fluid of patients with chronic adult periodontitis. Free Radic Res Commun 1991:15:11-6. 35. Linden GJ, McClean KM, Woodside JV, Patterson CC, Evans A, Young IS, et al. Antioxidants and periodontitis in 60-70-year-old men. J Clin Periodontol 2009;36:843-9. 36. Abou Sulaiman AE, Shehadeh RM. Assessment of total antioxidant capacity and the use of vitamin C in treatment of non-smokers with chronic periodontitis. J Periodontol 2010;81:1547-54.